Companies that require lifting and access equipment fitted with rail gear can find a range of customized solutions at Elliott. 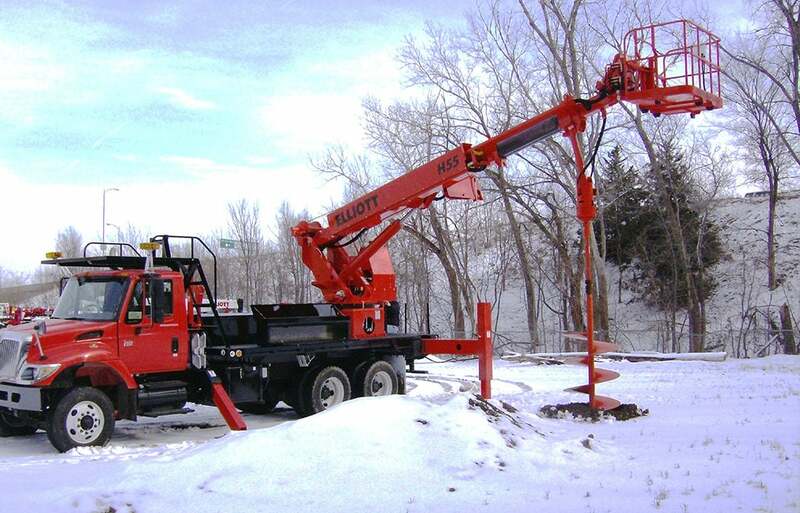 With a wide range of working heights and crane capacities available, Elliott has the right tool for your job. Our engineers will work closely with you throughout the process to make sure you get just what you need for your application. From special long-stroke outriggers to custom bed/body designs, Elliott’s engineering and design resources can provide a unique set of solutions that will help your business or organization grow. Plus, with Elliott’s Lifetime Structural Warranty and nationwide distributor network, finding a local partner to provide top quality service and support is easier than ever. Contact us today to discuss your specific equipment needs. There’s a solution for you at Elliott. 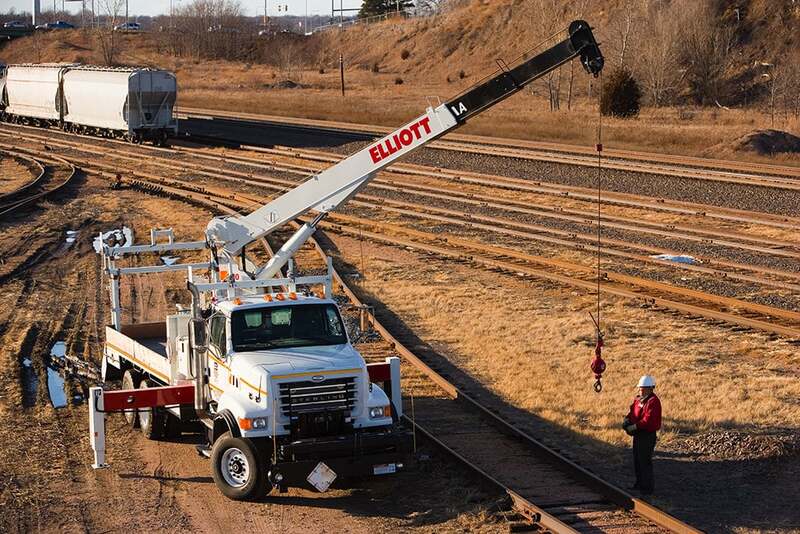 Elliott’s telescopic boom design provides maximized productivity by eliminating complex articulated booms and the risk of tailswing when working on busy rail lines. 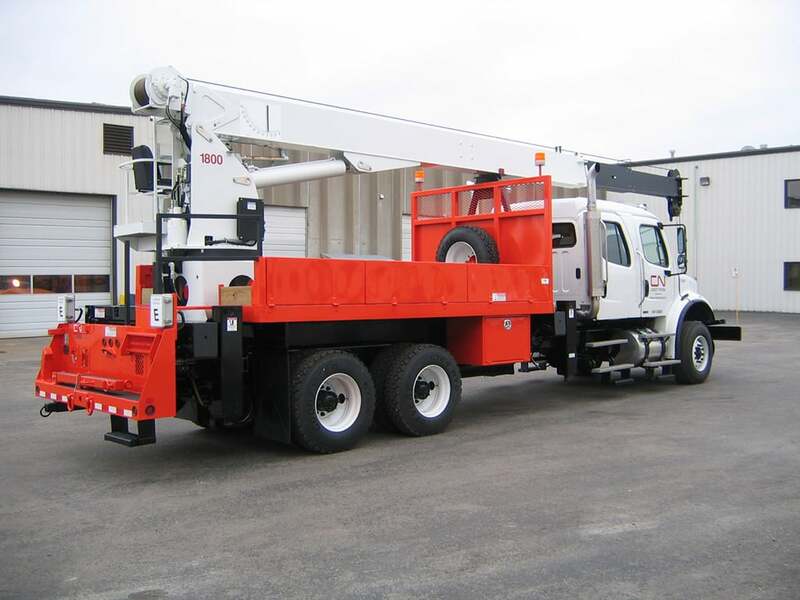 Plus, Elliott’s HiReach design allows for the utilization of a winch for material handling for a two-in-one product. Both the HiReach and BoomTruck products are available with personnel lifting, material handling and digging capabilities thanks to Elliott’s custom engineering department. 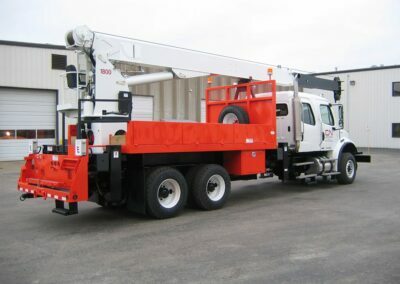 Add a winch and an auger to an Elliott HiReach or a platform and auger to a BoomTruck to maximize your investment and budget. 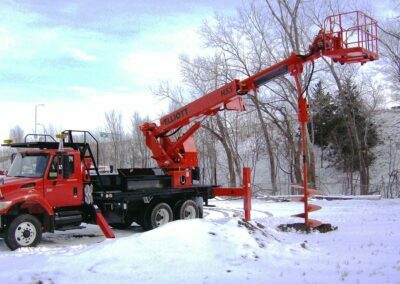 Elliott offers specialized outriggers that make work easier in difficult applications, like working on a steep rail grade, to ensure that you can operate safely and quickly. We can eliminate the need for outriggers entirely on certain rail products. 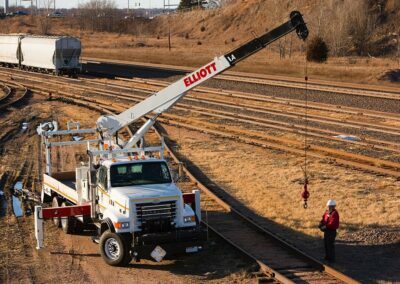 Elliott’s I-Series insulated HiReach models offer 46KV insulation and a telescopic boom design for zero tailswing and material handling capabilities for work on catenary lines, lighting and more. Choose from a wide variety of safety lighting and illumination options that increase safety on the job. All Elliott products are built to last with the best components available and are backed by our Lifetime Structural Warranty. 46KV insulated models with out-down outriggers. Service body options on most models. New military grade non-skid coating on bed. Two year warranty on BoomTrucks. New control box and platform floor. New EZR platform for easier attachment and reduced movement during travel. New jib winch stows in platform, saving setup time and bed space.